Media Innovation Fellows gather to share their findings. Over the summer, five recent UNC-Chapel Hill School of Media and Journalism graduates led projects at local media companies in North Carolina to help them embrace new technologies and respond to changing consumer needs. 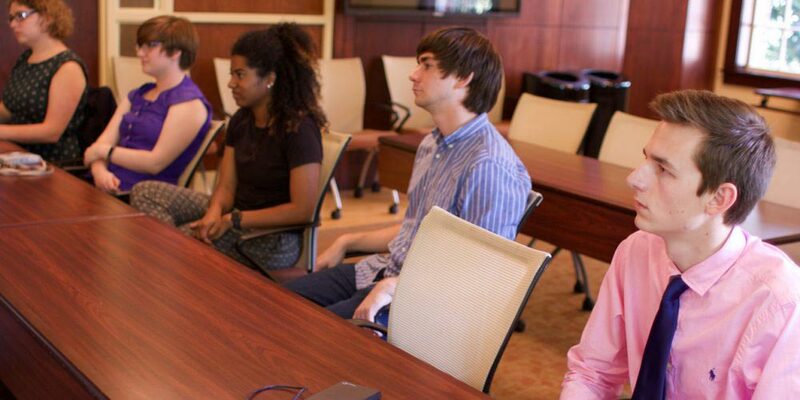 The Reese News Lab, managed by Professors Steven King and Ryan Thornburg, gave the fellows access to data journalism tools and encouraged entrepreneurial thinking. The 2017 Media Innovation Fellows are: Alexis Barnes, Kate Boyd, Lindsay Carbonell, Robert Kinlaw, and Patrick Seelinger. Kate Boyd and Lindsay Carbonell tested their coding skills in developing a prototype of an Artificial Intelligence journalist using a database of user questions to create a chat-based information service through the Facebook Messenger app. The Wilmington Star News has used a product called “My Reporter” where viewers can submit questions to reporters that may be answered and posted on their website. It has been a time-consuming process for the organization that Boyd and Carbonell looked to streamline using an automated system. Their prototype has limitations due to the format of the existing platform, but it could be scalable so that other newsrooms can use it. In partnership with The News Reporter in Whiteville, Patrick Seelinger worked on “C-note” which is a cloud-based service for sending push notifications and text messages to local media subscribers. The app is scalable for different sized organizations and was designed to keep costs of operation at a minimum. There is excitement within the Reese News Lab to continue work on C-note even after Seelinger’s fellowship concludes. Alexis Barnes spent the last year learning how to use Virtual Reality technology as news reporting in the Reese News Lab and helped on all the Media Innovation Fellows projects internally. 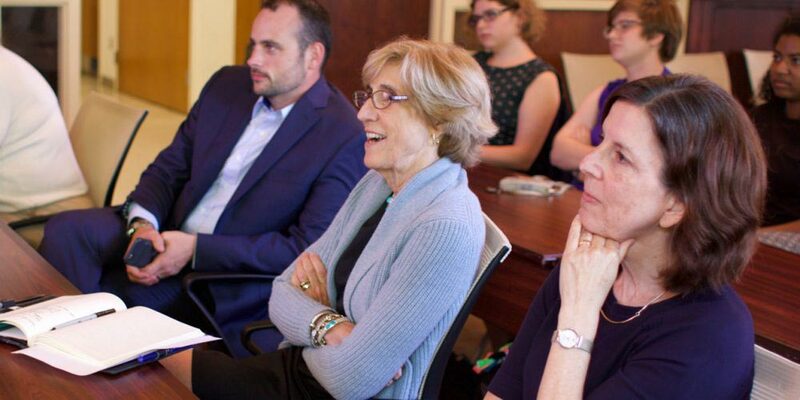 Dean Susan King enjoys the Media Innovation Fellows presentation along with Louise Spieler, associate dean, and Professor Steven King. The Center for Innovation and Sustainability in Local Media provides full support for the fellows made possible by a grant from the Knight Foundation. 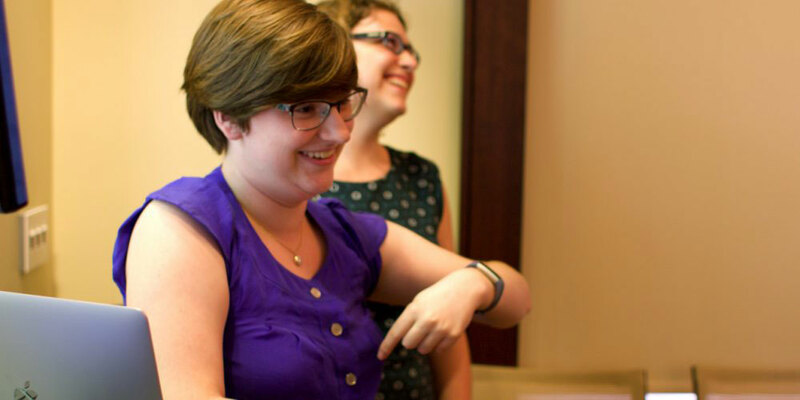 Kate Boyd and Lindsay Carbonell share a laugh during their presentation as Media Innovation Fellows.